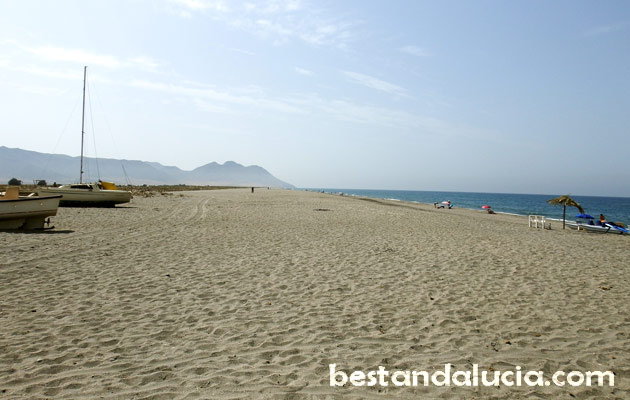 Sun-soaked Almeria lies on the Costa de Almeria, in the northernmost province in Andalucia bordering Costa del Sol to the south, and Costa Blanca in Murcia to the north. The city is much more than the sun and beaches. Almeria abounds in many interesting places to visit, some of them very unique. 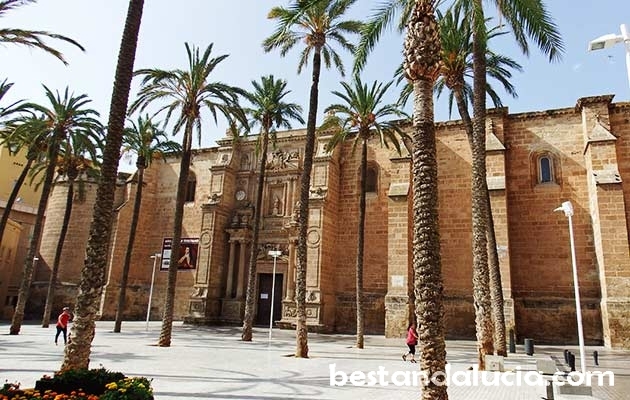 La Alcazaba complex with great panoramic views of the city, lovely Iglesia de la Virgen del Mar, Almeria Museum, impressive Cathedral are some of the top attractions in Almeria. 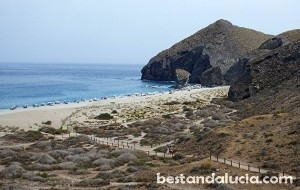 Cabo de Gata nature park, Oasys Mini-Hollywood and Sorbas cave complex, all described below, are the most interesting tourist highlights located near Almeria. 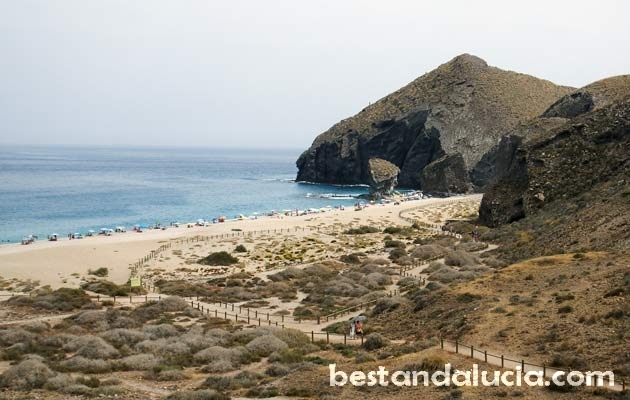 Comapred to other summer resorts on the eastern coast of Andalucia, Almeria is still fairly unknown. If what you are looking for is plenty of sun, unspoilt nature, spectacular beaches, and some adventure, this is the right place to visit. 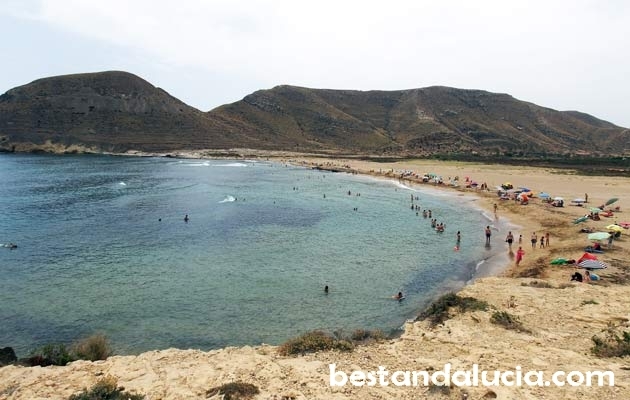 Almeria makes for a great romantic summer destination for couples. 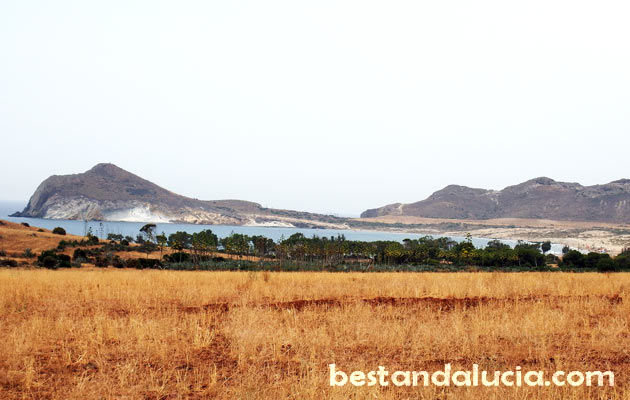 It’a also one of the best destinations for cheap family beach holidays. The closest airports are Alicante and Almeria. Try to avoid late July and August, the heat in Almeria can be quite intense! 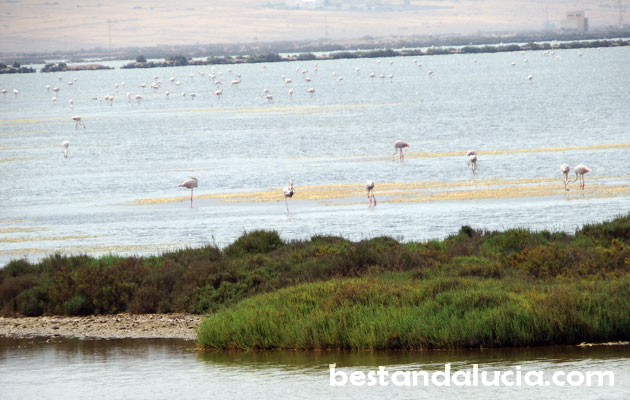 Located near Almeria is Cabo de Gata, an ideal place for all those loving nature. It’s a wonderful large nature reserve with stunning rocky 20-miles long coastline. It boasts beautiful unspoilt beaches with hidden coves, transparent water and delightful peacefulness. 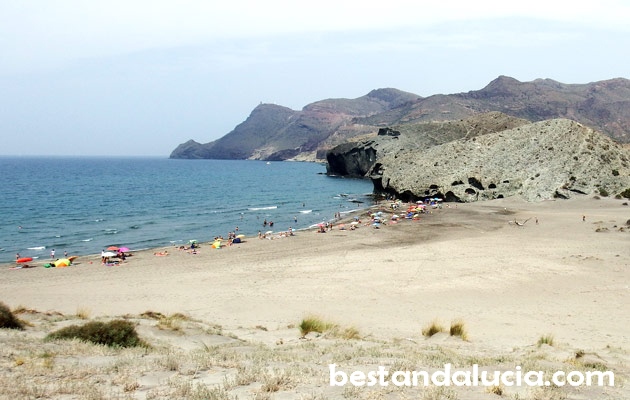 The superb Playa de los Muertos is probably the best beach there. 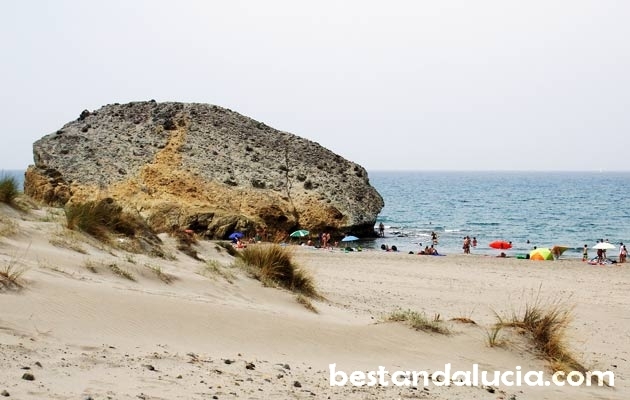 Cabo de Gata is a one of the best places for long walks, snorkelling, swimming or just winding up on the beach away from the hustle and bustle of civilisation. The dry province of Ameria shares many similarities with Texas and Arizona. For this reason in the 60’s and 70’s the Desert of Tabernas became a very popular alternative to filming westerns in the USA. Today the two Hollywood-style filming sets are open to tourists. There are three studios opened and the most popular seem to be Oasys Mini Holywood. Running around the wild west set like a real cowboy, or storming into a saloon like a gunfighter and pretending you are shooting the bad guys can be fun! 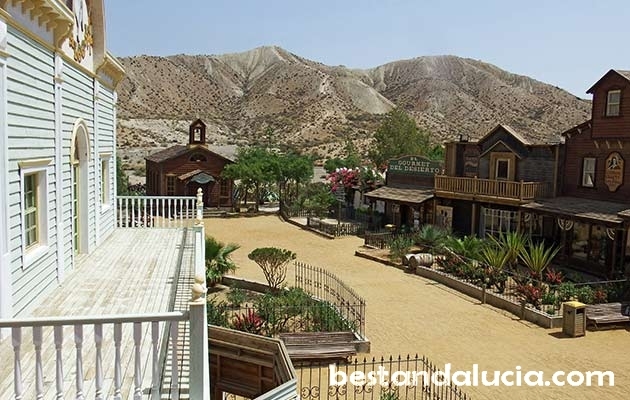 Indiana Jones, The Bad and the Ugly, Once Upon a Time in the West, A fistful of Dollars all have been filmed on the desolate and arid lands near the village of Tabernas. The list of celebrities who have visited the place is quite amazing and include Clint Eastwood, Steve McQueen, Bridgette Bardot, Harrison Ford, Sean Connery, Henry Fonda. Only 40km north-east of Almeria lies the beautiful village of Sorbas. Sorbas boasts an incredible network of caves, one of the largest in Europe. In this most singular place, marvelous stalactites, stalagmites, pillars stretch over several kilometres. Pre-book a guided tour and head off the the Caves of Sorbas for a real adventure. If you enjoy a bit of adrenaline, book a 4,5-hour technical guided tour which can be a quite a challenge even for really fit people.